Founding Father - ArEx Laboratories Pvt. 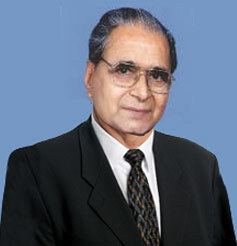 Ltd.
Late Mr. N.V. Gunjikar ventured into the pharma industry in 1956 and went forward to building this empire. He was a patriot, a nationalist and an idealist. He always wanted to contribute something original to human health. He was a post graduate in Pharmaceutical Technology from University Department of Chemical Technology, Mumbai – one of the premier institutes in the field. After post graduation, he started his work in product development and manufacture in the pharmaceutical industry. With vision, determination and willpower, he translated his dream of establishing his own enterprise into reality. Dr. Ajit Gunjikar and Dr. Satish Gunjikar. To emerge as a leading drug discovery pharma company, both in terms of synthesizing basic drugs meeting international standards, together with developing and marketing contemporary and modern formulations for both Acute and Chronic therapeutic segments in India and in overseas markets. The Company aims to alleviate human suffering, help prevent and treat diseases. The Company will make a positive difference to the quality of human lives by contributing to prophylaxis and treatment of diseases.